China's top information office has held a record number of news conferences this year on key issues that have drawn worldwide attention. In 2016, it will be even more open and release valuable information on changes and development in China, the head of the information office said. China's rapid economic development and growing role on the international stage have seen many businesses, including a large number of State-owned companies, expanding overseas and engaging in multinational mergers and acquisitions against a backdrop of growing global economic integration. After extending his warm welcome, Zhou said that relations between the two countries have developed rapidly and the cooperation between their judicial bodies has also deepened over the last years. 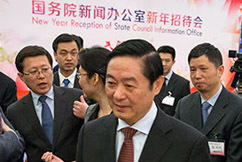 Meng Jianzhu, head of the Commission for Political and Legal Affairs of the Communist Party of China Central Committee, met a delegation of cyberspace security enforcement officials led by Alejandro Mayorkas, deputy secretary of the United States Department of Homeland Security, in Zhongnanhai, the central government's headquarters. 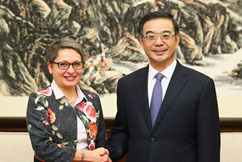 Zhou welcomed Lebedev and briefed him on China’s rule of law and the work of courts, saying that the just-concluded fifth plenary session of the 18th Communist Party of China was an important conference in building an all-round well-off society. Agi Veres was grateful for Shen's visit and said that the UNDP has paid great attention to law-based governance and is willing to continue strengthening long-term cooperation with the supreme court. She said that the UNDP would continue to support China's judicial reform with available resources. 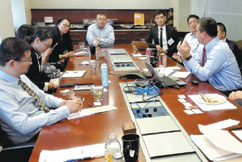 Huang met with officials from Israel’s Ministry of Foreign Affairs, Congress, the Hebrew University of Jerusalem and the Supreme Court, and had lunch with the Israeli Attorney General. Supreme People’s Court Vice-President Jing Hanchao, leading a Chinese delegation, visited the UK and Switzerland from Oct 10 to17.